Key points in helping you decide which app is best for your organization. 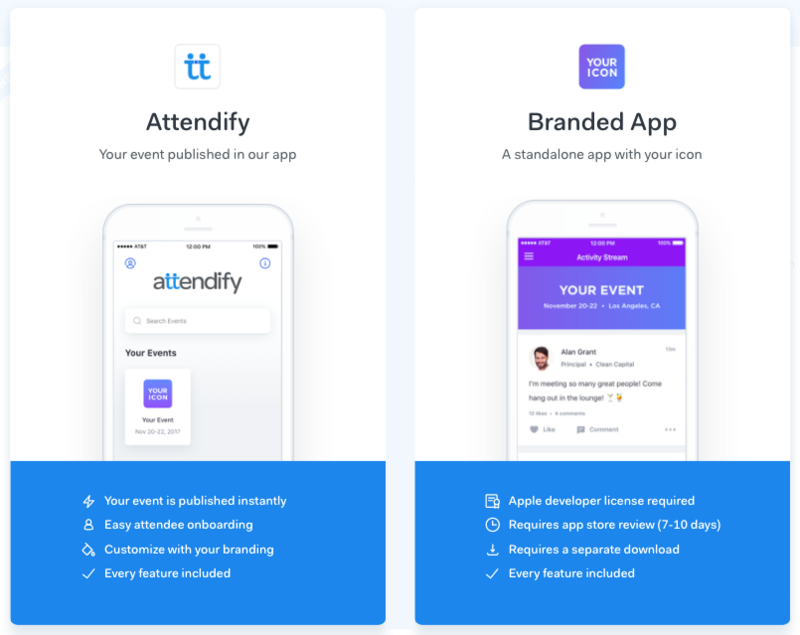 Attendify offers two mobile solutions for individual events. This overview will cover the main differences between the two to help you better decide what option is best for your organization. The One Event App is published to the Apple and Google App stores. Users need to search for the app within it and download it to their devices to access it. The Apple App store requires any organization wanting a branded one event app to have their own Apple Developer account to publish the app under. Apple charges $100 for this account annually and to publish the app there we will need access to your developer account to assist with this. Due to the app being hosted under your developer account things like policy updates and such will need to be managed on your end when they come up. When publishing an app to the app store it can take up to 10 business days from the time of submission for publishing for it to be published to the store. It often does not take quite that long. Keep in mind it will be suspect to any potential delays that may occur on Apple or Googles end. With the Attendify app your event is published directly to Attendify's branded container app. Users will need to download the Attendify app and search for the event within it to access content. Publishing times for the Attendify app are instant. You can build your app from start to finish and publish that it that day and have it available for use right away. The only option to secure the One Event app is by uploading an Attendee list. This feature requires you to upload a list of emails to generate pre-created profiles in the app. Making it so only users with access to that email can access the app. With the option of the Attendee List you can enable email verification, doing so requires the user to verify their email address before being able to access the app after signing up. The One Event App can be hidden in the app stores, but if its hidden in the app store it is unaccessible to users until the app is published. 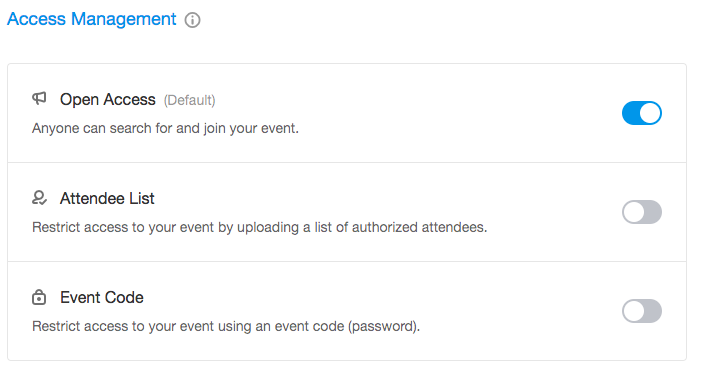 The Attendify app can be secured with the Attendee List feature just like the One Event App and setup is the same as well. The Attendify App can be secured with the event code feature. This is a code that you create and distribute to your users that they will need to enter in the Attendify app. This is a great alternative if you don't want to or can't create an Attendee List for your event. Your event can be hidden from search in the Attendify app. 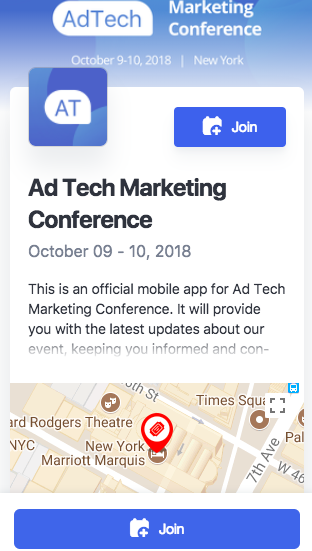 In addition, if you have enabled the event code feature, attendees will only need to enter this in the Attendify app to access it without it becoming searchable in the Attendify App. Only the Attendify app offers the event profile feature. This is the page that comes up after an Attendee has located the app via search and before they have joined it. Here you can add a description about your event, a map of where its located, as well as cover image and icon. The One Event app does not offer this option. If you have any questions about anything you see here feel free to reach out to our support team at support@attendify.com or chat with us on any Attendify webpage.